Grab your mortar and pestle and start pounding. Homemade spice blends are easy to make from simple, unprocessed ingredients and taste delicious. A sprinkle of ras el hanout or a dollop of green curry paste and your taste buds come alive! We rely on spices for flavor and, at times, the foundation for a whole meal. The challenge, though, is to avoid the musty jars of commercially ground spices and mixes and instead start making our own at home. Knowing what goes into your spice mix makes it much more likely you’ll grab it from the rack and start sprinkling. I like to buy whole spices in small quantities from bulk bins for the freshest flavor. Spices don’t have a long shelf life, and once ground they lose their pizzaz quickly. Homemade spice mixes are not labor intensive. Usually, they involve just a few minutes of toasting, grinding and perhaps a little chopping if making a mix that includes fresh herbs. Keeping your pantry stocked with staples such as raw nuts and seeds and whole spices makes it all the more easy. The results are healthier, more flavorful and often less expensive than store-bought. Inspiration can be found by reading what’s listed on a jar label at the market and then making your own fresh version at home. To prepare a spice blend, whole spices, raw seeds and/or nuts are quickly roasted in a small pan on the stove top or in the oven (be sure to stir often and keep a close eye on them to avoid burning). Your kitchen will fill with warm, toasty scents as you then pound the spices with a mortar and pestle. I often pause to inhale deeply – such homey, comforting fragrances! 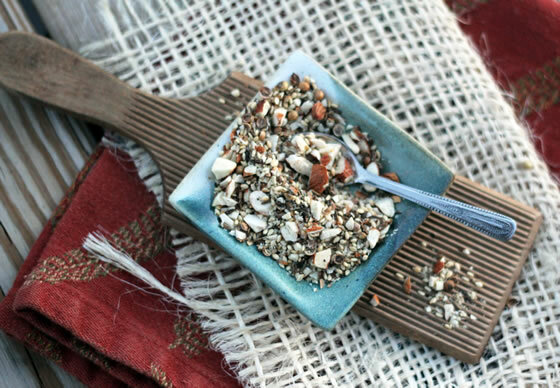 An Egyptian spice blend that is popular throughout the Middle East and is a big favorite of mine is dukkah. Nuts (usually hazelnuts), dried chickpeas, sesame seeds, coriander, cumin, salt and pepper are all traditional to include in this mix. Recipes vary from family to family – I think there are as many variations as there are cooks! Some might be more herbal, some spicy, but they all involve roasting and pounding the spices to create the blend. Dukkah is typically served with bread and olive oil for dipping, but don’t limit yourself here. Sprinkle it on veggies, roasted potatoes or eggs. Garnish a bowl of soup or rub some onto salmon before grilling. There are many ways to enjoy dukkah and I reach for my jar of it often. Dukkah is typically served with bread and olive oil for dipping, but don’t limit yourself here. Sprinkle it on veggies, roasted potatoes or eggs. Place a small, heavy pan (I use a cast iron one) on the stove over medium high heat and warm it for a few minutes. Add the almonds and stir them for a few minutes until they are toasted and fragrant. Pour them onto a cutting board and add the sesame seeds to the pan. Stir the seeds for a minute or two, until they start browning. Quickly pour them into a mortar. Repeat the toasting with the cumin and coriander seeds. Grind the seeds together with a pestle. Finely chop the almonds and add them to the mixture and along with the pepper and salt. Grind a few more times to mix. 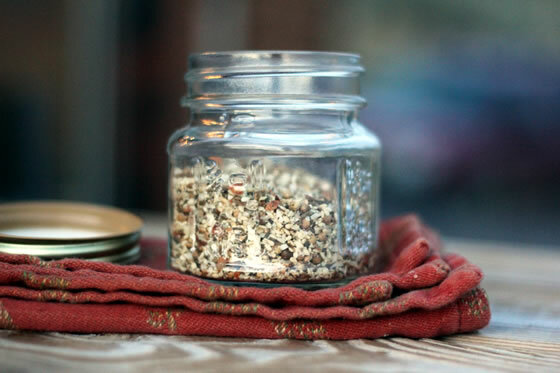 Store the dukkah mix in a covered jar and sprinkle liberally. Don't have a mortar & pestle? You can use a spice grinder instead. Hannah Cordes lives in Seattle and the Methow Valley with her husband and two college-aged sons. She is the owner of a kitchen store named Aspen Grove. She was the chef at Hillel UW for six years and these days she can’t resist a DIY project in her kitchen. Hannah prepares fresh, seasonal food for her family and friends and writes about it on her blog, Blue Kale Road. Her happiest place is around her family table crowded with guests. You can also find her on Facebook, Twitter and Pinterest. 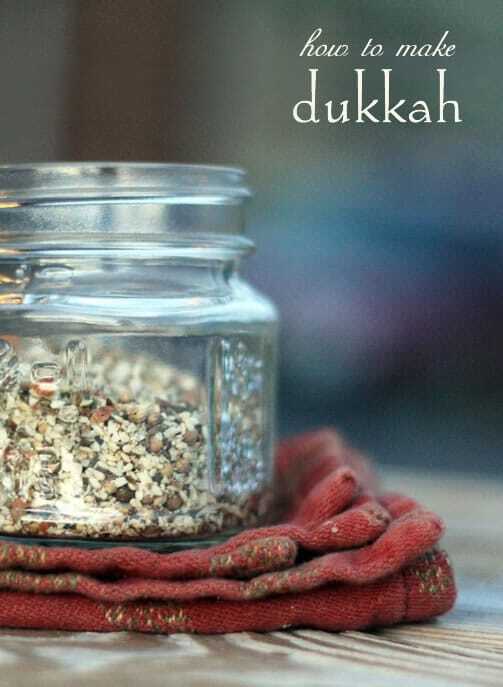 Never heard of dukkah before seeing it at Trader Joe, which of course I bought. It’s great. This recipe looks great. Will use Magic Bullet to grind. Thank you! I’m lucky enough to have both a mortar and pestle and a spice grinder, so I’m good to go. 😉 I’ve never made dukkah before and I don’t know why not – it’s quite straightforward. You’ve inspired me! Thanks so much. So happy to see Hannah’s recipe here today! I like the idea of Dukkah with roasted potatoes or even eggs! I have everything in my kitchen so I’ll give this a try very soon!